The Magnificent Twelve - GeekForce | Experience The Power Of The Geek! Many things have changed in my life, some for better and some not so, but some things have pretty much stayed the same. The main thing that has remained a constant is my love of Star Wars. I’ve already recounted my first experience of going to the cinema and being blown away by said film in a previous blog (http://www.geekforce.co.uk/films/long-time-ago-galaxy-far-far-away/) but my love went way beyond simply watching the film. 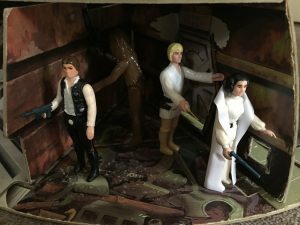 All I can say is thank God that Palitoy decided to take on Kenner’s 3.75” Star Wars figures license as if they hadn’t clearly I would’ve gone mad! Fortunately, they did bring them out, unfortunately I went mad anyway – on collecting them. 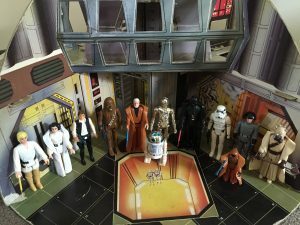 This blog will focus on the “Magnificent Twelve”, the first set of Star Wars figures and vehicles released in the UK in 1978. Bizarrely the first figure I can remember receiving was actually before I saw the film, or really knew about the film. I was four years old. What was that first figure? None other than R2D2. I got him from a toyshop in Bulwell called Babyland (later Skills). I can recall looking in the window of the shop and seeing him, on his card, and immediately wanting to know what it was and what it did. Star Wars figures were 99p when they first came out and so this was a reasonably expensive toy even back then, particularly as it was a small figure. To clarify; figures that I had been bought up until this were what I would class as dolls – Mego superheroes, Action Man, and Cyborgs from Denys Fisher. These were usually in 5’ and 12’ size and had removeable clothes so Artoo was a revelation. I had to wait until we got home to remove the plastic blister case and free the overweight glob of grease from the cardback. This did mean I looked at the other figures on the back of the card whilst on the bus journey back and was hooked in. 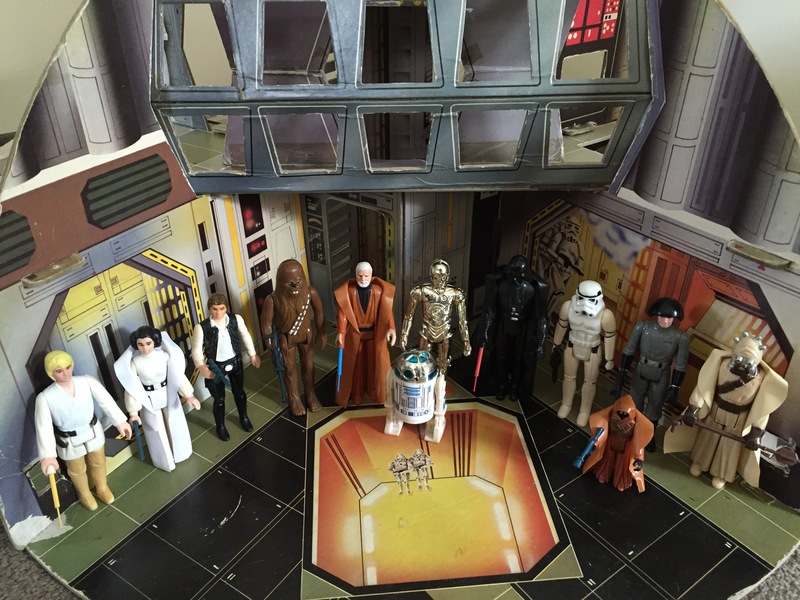 I wanted to know who the others were – after playing with Artoo I knew I wanted the other figures and toys. Seeing the film later that year only confirmed and sealed my love for the characters and toys. By the time I’d seen the film I had a small collection of the figures – the second one to be bought was Chewbacca, the third was Luke quickly followed by Han, Ben and Leia. The combination of the film, the toys, and the comics really fired my imagination and allowed me to play in an immersive, creative way, making my own stories, re-enacting scenes and creating my own playsets from Lego, blankets, and any boxes I could get my hands on! I believe that it was these early experiences with the toys that began to form my love of the arts, writing and creativity that continue to this day. Is it just me or does anyone else miss playing with toys? Do you remember being tired at the end of a day – especially during a school holiday – simply because you had been playing? 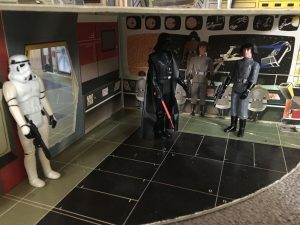 My reply was C-3PO – my dad took out said figure from behind his back – and Darth Vader – he revealed the Dark Lord of the Sith, much to my surprise and excitement! He’d left work early that day and had gone to a shop called Lynda’s babyland in Netherfield to collect them. My mum had phoned the shop earlier that day to see if they had any new figures in stock. My parents have always been great in that way. If anything they fuelled my passion for the film, all things sci-fi and for collecting toys; all things that I have carried into adulthood. Christmas that year was an amazing time for Star Wars toys. It was, and still is, a magical time for our family and the Christmas of 1978 was the first one that really stands out in my mind. 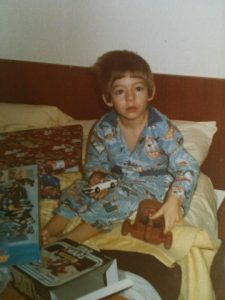 The anticipation of Santa visiting, having to be in bed and asleep so I didn’t see him as obviously that’s not allowed, the excitement of waking early on Christmas Day morning were made all the more memorable by opening a Palitoy Landspeeder, X-Wing fighter and three Stormtrooper figures. It was the first of many Christmases and birthdays that would heavily feature my favourite science fiction movie. The following year I was bought the Palitoy Death Star playset and the Millennium Falcon. They were, and remain, the jewels in my collection. This is the big difference that 3.75” scale made; vehicles and playsets that the figures could interact with. The larger figures did have these but the size made them more expensive and less collectable. The photos accompanying the blog are of my original twelve Star Wars toys and the Death Star playset. They are well played with but well looked after. I’ve had to replace weapons over the years (and yes I don’t mind repro!) some figures have been lost and, thankfully, found – Han went missing only to be discovered a few days later in the neck of a Rod Hull Emu puppet, Leia vanished only to reappear sometime later – to this day we don’t know where she had got to for those missing days, a plastic Agatha Christie if you will! The Death Star has had some repairs and needs a gunner canopy but no matter how many times the Rebellion tried to destroy it the fully functioning battle station lived to blow up planets another day. I think for forty year old figures they are in pretty good shape – probably better shape than any of us who watched the film back in 77/78. Like the Christmas decorations that come down from the loft once a year they are something that almost remain frozen in time and will no doubt still be here in another forty years’ time. People have asked me why I saved them or why I didn’t sell them years ago. I can’t part with them and I never will, it would be like selling my memories or selling my childhood. To quote a popular book “when I became a man, I put away childish things”, well they are packed away but they come out with surprising regularity. I just hope that one day I have a child/children who I can brainwash into loving share my love of Star Wars with so they can play with these same toys, create new stories, and enjoy them in the way I have for so many years. We had a few troopers that we had doubles of; this was because both myself and my bro would get one each. As an adult I’ve built up a decent Imperial army but nothing massive – generally two of each trooper or officer with a few exceptions. We do have quite a lot of stormtroopers now and Emperor’s Royal Guards. We like to get them from car boot sales and restore them, rather than pay mad prices for them. Thank you for leaving a comment. We’re pleased you like the blog.